An innovative complexion pick-me-up in a universal and ultra-flattering shade of peach with golden undertones for radiant, glowing skin in an instant. Buildable colour that blends and buffs seamlessly into the skin. Enriched with plumping active Adipofill, light reflecting pearls and natural polymers help absorb excess oils for long-lasting results. Apply to the cheeks and a light touch to the forehead, nose, chin and eyelids. Age Repair Perfect Canvas is the ultimate complexion kit. This all-in-one advanced treatment foundation redefines the complexion for intensely hydrated, conditioned and airbrushed looking skin. The ultra-lightweight ‘true-skin’ and innovative colour-adjusting formula with optical diffusing pigments smooths and blurs the appearance of fine lines, open pores and uneven skin tone. Formulated with broad spectrum SPF30 this foundation is enriched with advanced anti-ageing ingredients such as Suberlift, a clinically proven botanical derived from the natural extract of cork oak (Quercus Suber) that lifts and firms the skin, Nyamplung oil which stimulates cell repair and limits the oxidative stress responsible for premature ageing, plus a synergistic complex of anti-oxidant vitamins. Apply with fingertips or a foundation brush and blend out from the centre of the face, or in areas needing most coverage. 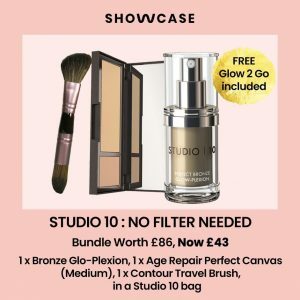 1 x Travel contour brush & Studio 10 Gift Bag. All of this is worth £86 but is currently on offer through Showcase Beauty for £43. A MASSIVE £43 saving. 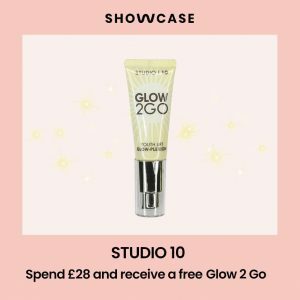 And it doesn’t stop there…….when you spend £28 on Studio10 through Showcase Beauty you will receive a FREE Glow 2 Go. Click here to shop this fantastic offer.